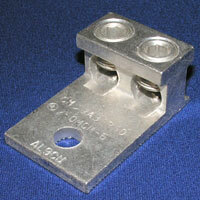 Two Hole Solderless - Possigrip | Cal Fasteners, Inc. Unique ridges on the bottom of the contact surface of these two hole solderless lugs provide contact points for an electrically secure joint of the lowest resistance for improved current flow. CMC designed the screws on these PosiGrip conductors to extend beyond the barrel sides, allowing for better, more secure compression of the conductor. This specialized design spreads the conductor strands to help dissipate heat; it also improves pull-out safety features and capabilities. These aluminum mechanical connectors feature exclusive wire way designs that provide optimum transfer of current. A straight line flow through the connector provides the path of lowest possible electrical resistance. 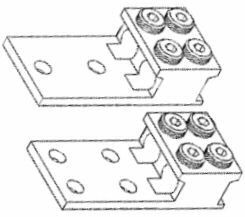 A positive wire stop is included with each lug. Request a quote on PosiGrip 2-hole solderless connectors, or contact Cal Fasteners to learn more. CMC’s PosiGrip aluminum solderless connectors are dual-rated for use with aluminum and copper conductors, and specially designed to meet the rigorous requirements of UL 486B and CSA1165A specifications. Low initial contact resistance provides long working life and helps meet 486B requirements. CMC designed these aluminum mechanical lugs with I-beam bodies, conductor hole configurations, and specially treated screws, all of which will reduce or eliminate high-resistance connector failures caused by creep, thermal expansion, and insufficient clamping force. The unique I-beam design provides unparalleled gripping action that enables the set screw to separate conductor strands and break down inner strand oxidation. This provides exceptional performance, greater flexibility, and long working life, regardless of the conductor type used, even on compressed and compact aluminum conductors. Every lot of PosiGrip products is thoroughly inspected for proper dimensions, set screw and conductor hole alignment, material properties, and plating. Screw and body thread class are also tested. All PosiGrip connectors are certified for use with conductors that have thermal insulation ratings of 90°C or less. All products are UL and CSA listed, and RoHS compliant.